I can’t get enough of fall themed mysteries this time of year. I just finished Tangled Up In Brew by Joyce Tremel and wanted to share a little about this perfect fall read. And give you the chance to win a copy for yourself! This is the second book in the “A Brewing Trouble Mystery” series and follows the adventures of Max, a female brewpub owner in Pittsburgh, Pennsylvania. 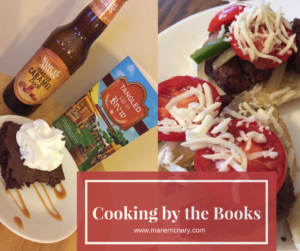 During this adventure (the first one I’ve read in the series), Max finds herself investigating the murder of a much disliked local restaurant critic who dies after taking a bite of Max’s boyfriends entry in the Three Rivers Brew & Burgers Festival burger contest. In her attempt to clear Jake’s name, Max finds that this critic has things in his past that he’s worked to keep hidden and she is determined to find out the whole story and save the day. I found myself instantly drawn to many of Max’s family and friends in this book. She has a delegation of family that lives close by, including her parents and a couple brothers. Add in some fellow brewery buddies and fellow shop owners around her pub, and there is a heavy contingent of likable background characters that you can see playing a larger role in future books. 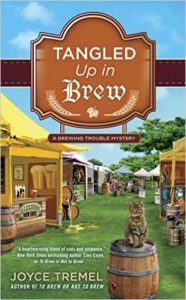 I was oddly excited to read a cozy mystery that focused around a brewpub. It haven’t read any cozy mysteries with that setting before and it was a nice change. I also liked that this inspired a few heartier recipes being included in the back of the book. I just tried out the Caramel Pecan Brownies and Jake’s Brew Burgers last night. They were a hit with the hubby and my three boys! So sit back, crack open a cold one, and enjoy. And don’t forget to enter this great contest to win a free copy.